Mr. Yoy asked if I could bring the boys by for dinner and take a look at his new office with all of his pictures professionally hung. I, of course, obliged as I am always looking for something to kill time before bedtime. WOULD YOU LIKE TO DRIVE INTO THE HEART OF BUCKHEAD IN THE MIDDLE OF RUSH HOUR? WOULD YOU LIKE TO STAY AT HOME FROM THE HOURS OF 4-7PM WHILE YOUR KIDS SLOWLY DRIVE YOU INSANE? This mom would take traffic any day of the week. So we headed off to Terminus. We made pretty good time, by the way, until we hit Piedmont. What a cluster! We hit up Mr. Yoy's office first. It looked fantastic! 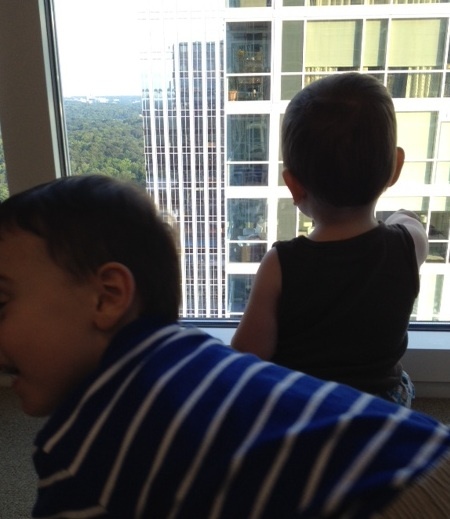 Big and Little E seated themselves next to the window and ogled the women at the three hotel pools within view. We walked over to Ru San's for some sushi dinner. I give them props for blasting their music. It makes me much more relaxed as there is something louder than my children. But I take away props for seating everyone in one small corner. We were much too close to some of the other diners who were there sans children and I'm sure muttered SH*T! when we were sat next to them. I would! The boys were ok at dinner. Little E complained his way through dinner and Big E had ants in his pants. On our walk back to Mr. Yoy's office, Big E asked if we could spend some more time with daddy. It was so sweet, that I agreed. Plus, they both took two hour naps and there was no way they were going to fall asleep anytime soon. We made our way back to Mr. Yoy's office and the boys immediately went back to the window. They smeared their sushi hands all over the glass, so that it appears that Mr. Yoy now has special frosted windows in his office. The Yoys then discovered the textured glass on one side of Mr. Yoy's desk. Now THIS was a goldmine. They smashed their faces into it from each side. They were like distorted versions of themselves. They were giggling uncontrollably. It was getting louder and louder. Mr. Yoy sat at his computer replying to emails, unfazed by the disaster that was unfolding. Sniff. Sniff. Little E must have dropped a bomb in all of the office excitement. We had swiftly turned Mr. Yoy's office into a loud, dirty, hot box. I changed Little E's diaper as fast as I could. Big E thanked me for letting him see Little E's poop. Weird, but polite. I told Big E we were leaving. He negotiated four more minutes. Then another five. Good lord, he is just like his father! When I attempted to put Little E in the stroller he went insane. He did not want to part ways with the glass desk. Big E, for some reason, also wanted to be in the stroller, which NEVER HAPPENS. He also started crying once we had Little E locked in. Yes, it took both parents to get him in there. With two crying Yoys, Mr. Yoy could not get us to the elevator fast enough. As the elevator opened, we both shot each other a smirk. HOW IN THE HELL COULD WE HAVE CREATED THESE TWO DEMON BABIES? We were both thinking the same thing. Except he got to stay at work and I had to go home with them. As we descended in the elevator the screaming continued. How did we end up on the Tower of Terror at Universal Studios? We may not have been free falling, but trust me, this elevator ride was terrifying. I prayed that we didn't have to stop on another floor. I finally had the Yoys in their car seats and we were headed home. Big E felt the need to do a post-mortem on his behavior. I always find this humorous. MOMMY, HOW WAS I AT SUSHI? I'm never really sure how he wants me to respond. Is this on a scale of 1 to 10? Or is he looking for more of an essay thing? MOMMY, WAS I A BAD BOY AT DADDY'S OFFICE? This is a much easier question and answer. A resounding YES! Half crying, he asks if he can go back to Daddy's office to apologize. I stifle a laugh. I get so frustrated with his behavior, but then two minutes later he has me smiling and laughing. It's a skill, it truly is.